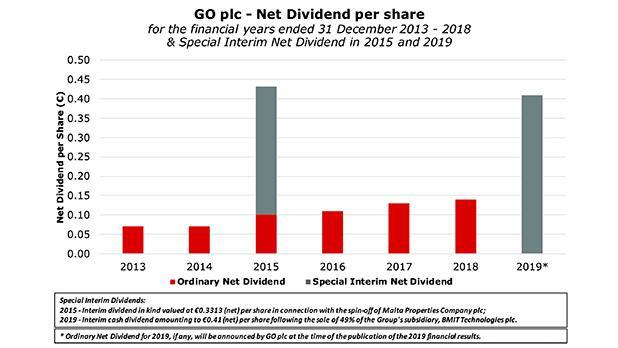 GO plc published its 2018 financial statements on March 8 with the main focus being the extent of the 2019 interim dividend rather than the actual performance of the telecoms group. Ever since the initial announcement of the offer for sale of the stake in BMIT Technologies plc in October 2018, GO always stated that the proceeds from the partial sale of BMIT will be used to ‘deliver returns to shareholders’. Following the successful IPO of BMIT which was concluded in January 2019, GO received €49 million from this transaction as it disposed of the maximum amount on offer representing 49 per cent of the issued share capital of BMIT. On March 8, GO announced that it will be distributing a special net interim dividend of €0.41 per share “in view of the profits generated from the sale” of BMIT. The total interim dividend distribution of €41.5 million therefore represents 85 per cent of the overall proceeds received by the company. In addition to the interim dividend arising from the BMIT windfall, GO’s directors are also recommending an ordinary net dividend of €0.14 per share. This represents an increase of 7.7 per cent over last year’s ordinary dividend. The combined dividend of €0.55 per share (representing a yield of 11.1 per cent on the current share price of €4.94) will be paid on May 30 to shareholders on the register as at close of trading on April 24. Notwithstanding the sizeable interim dividend of €0.41 per share, the ordinary dividend was increased for the fourth consecutive year (ordinary dividends have in fact doubled from the €0.07 per share in 2014). This is possibly a signal to the market of the company’s intentions in terms of its dividend policy. This consistent increase in dividends over the years should not be surprising given the strength of the group’s balance sheet. The latest financial statements show that the GO group had a net debt of only €56.5 million as at December 31, 2018 when compared to an overall group EBITDA of €69.5 million. The net debt to EBITDA multiple of 0.81 times shows that the group has a low level of indebtedness. In fact, the metric indicates that the net debt can be repaid in less than a year given the current level of operating profits. This compares very well with many international telecom operators and other multinationals which normally seek to increase the level of overall borrowings in order to achieve a more optimal structure and strengthen returns to shareholders via an improved return on equity. In an article I published on Malta International Airport plc a few weeks ago, I had indicated that Flughafen Wien AG (the operator of Vienna Airport and the largest shareholder of MIA) aims to establish a ceiling for net debt to EBITDA of 2.5 times. Apart from MIA which has no borrowings whatsoever (a rare occurrence for capital intensive businesses), GO’s net debt to EBITDA multiple of only 0.81 times places it among the strongest companies in Malta from this perspective. GO also ranks superior to all debt issuers in Malta. In fact, only four companies had estimated that they would have a net debt to EBITDA multiple below two times in 2018, namely Spinola Development Company Ltd (as guarantor of the bonds of Tumas Investments plc), Simonds Farsons Cisk plc, Premier Capital plc and MIDI plc. The low leverage of GO compared to its EBITDA generation shows the company’s ability to not only maintain a sustainable and growing dividend but also to take on additional debt funding to finance any strategic initiatives in the years ahead. In fact, the final paragraph of the company announcement issued by GO on March 8 states: “A strong and sustained operational performance and appropriate funding arrangements will allow the Group to continue to fund its investments in technology, honour its obligations with its bankers and pursue new investment initiatives aimed at increasing shareholder value”. This topic was also mentioned by GO’s CEO Nikhil Patil in a meeting with financial analysts last week. He explained that the group’s strategy for growing shareholder value is split into three parts. Most importantly, the management team needs to ensure that the core business performance keeps improving and the CEO indicated that since he took the helm in the first half of 2018, a number of initiatives were undertaken in this respect. The CEO indicated a concerted effort at cost reduction, the revamp of the product portfolio including the new sports package following the agreement with Melita as well as the digital transformation programme which will materialise over a number of years. In fact, an analysis of the financial statements shows that GO’s performance in the second half of 2018 improved over the first six months with the EBITDA margin strengthening to almost 45 per cent. The second area for building shareholder value is via capital restructuring. Mr Patil said that it is essential to optimise value creation from a company’s asset base and highlighted the success in this area from the spin-off of Malta Properties Company plc and the partial sale of BMIT Technologies plc. This led to significant benefits to GO shareholders through an improved stock market valuation especially when including the current value of MPC shares and the upcoming dividend bonanza from BMIT. The other area to grow shareholder value is via a selective acquisition strategy due to the natural limitations of the size of the Maltese telecoms market. This is one of the reasons for GO’s acquisition of a majority stake in Cablenet in Cyprus some years ago which is leading to a positive contribution to the group performance. In the announcement on March 8 it was revealed that Cablenet achieved a 7.8 per cent growth in revenue and the subsidiary now accounts for over 19 per cent of overall group revenue. Cablenet’s EBITDA contribution has also been positive and in 2018, the Cypriot company achieved a 12 per cent growth in EBITDA to almost €14 million. Although GO’s CEO believes that Cablenet can once again generate a double-digit growth in EBITDA in 2019, he repeated what he had said in the previous meeting with financial analysts in August 2018 that the consolidation of the telecoms market in Cyprus is inevitable. Mr Patil explained that Cablenet has a strong telecoms brand and the company’s financial performance enables it to finance its ongoing growth. The immediate priority for Cablenet is to accelerate the network rollout to improve coverage across Cyprus in order to achieve further growth in subscribers, mainly in the Sports offering following the deal with one of the other telecom providers Primetel. The CEO explained that Cablenet’s strategy also entails the provision of mobile telephony. Although the company recently became a mobile virtual network operator (MVNO) enabling it to become a quad-play provider, the next leap would either represent the acquisition of mobile frequencies or otherwise to consolidate with one of the three existing mobile providers. The Cablenet subsidiary is clearly a very important asset for GO in order to widen the group’s overall addressable market given the high penetration in Malta. Future developments in Cyprus are therefore important for the continued long-term success of GO. Meanwhile, the share price of GO has been among the best performers in Malta over recent months with the equity rallying by 25 per cent since the start of 2019 to its highest level in over 12 years. While an adjustment in the share price would be inevitable once the equity begins to trade without the entitlement to the total net dividends of €0.55 per share as from April 25, the future dynamics of the equity should be followed closely as Mr Patil continues to execute the group’s strategy by pursuing “new investment initiatives aimed at increasing shareholder value”.